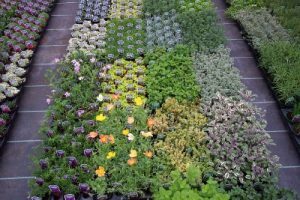 Millennium Plants specialises in the wholesale production and supply of high quality Cornish grown nursery stock for supply to retail establishments throughout the South-West. We endeavour to exceed our customers expectations with regards to the quality of our produce whilst continually striving to redefine the standards expected by our customers. Most importantly we offer a friendly and helpful service to our customers whilst aiming to build a long-standing sustainable relationship with our customers based upon trust and good will. Our reputation has been based upon the last twenty-five years of growing experience. We are proud to be supplying a comprehensive range of business customers from those looking for just a small assortment of plants, or for the larger outlet buying by the trolley. Our primary objective is in supplying plant material to Garden Centres, Shops, Landscapers and Parks. We do not supply plants to the general public. We take pride in being an environmentally aware company and work with various partners within the industry with regards to the use of peat reduced growing media and biological control of plant pests. Our pot and tray recycling service introduced in 2008 has been incredibly successful in minimising the wastage of unwanted plastic material. Further details upon request.